installation cost and a turn-down of not more than 4:1, the orifice plate continues to offer a very competitive solution for flow rate measurement. 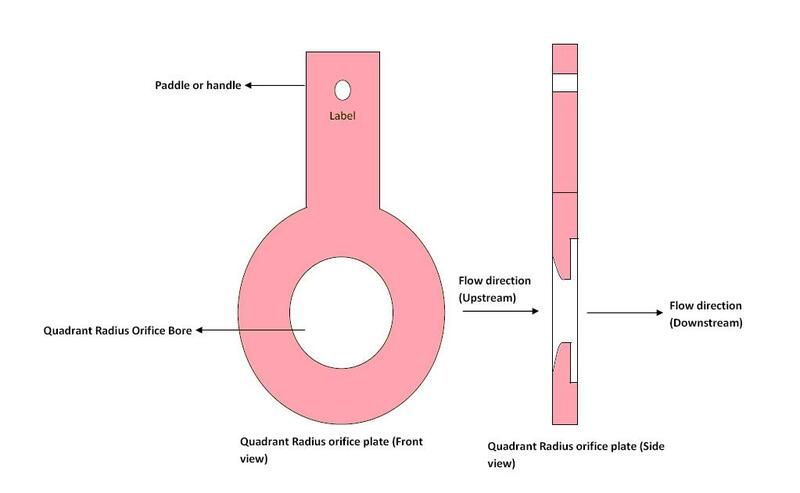 Here we introduce the most common types of orifice plates used in industrial process plants for flow measurement applications. 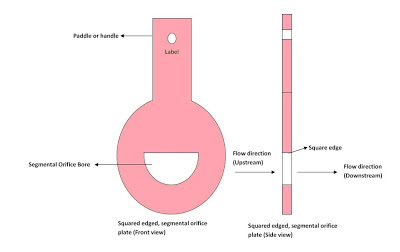 The most common orifice plate is the square-edged, concentric bored design shown below. This type of orifice plate is manufactured by machining a precise, straight hole in the middle of a thin metal plate. 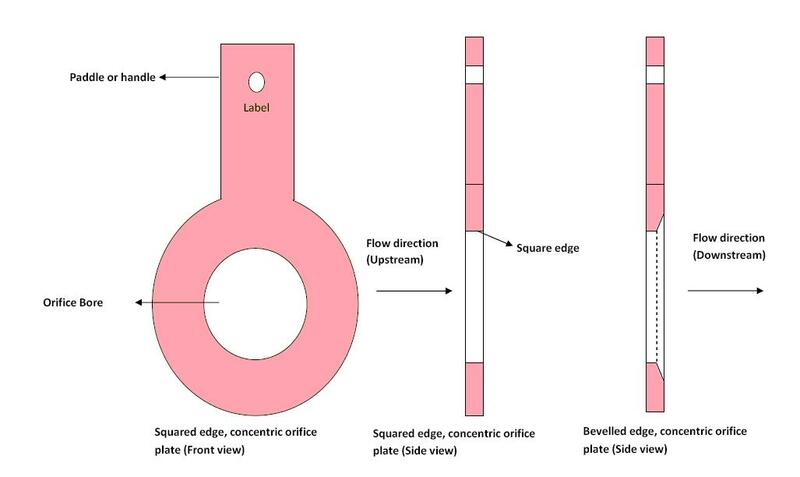 The concentric bored orifice plate is the most used design because of its proven reliability in a variety of industrial applications and the extensive amount of research conducted on this design. 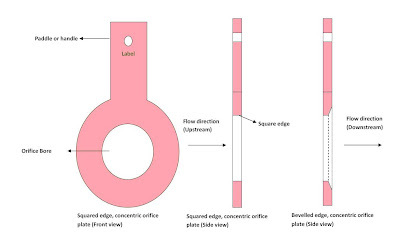 The concentric orifice plate is also easily reproduced at a relatively low cost. The concentric orifice is used to measure a wide variety of single phase, liquid and gas products, typically in conjunction with flange taps. plate to be used for measuring bidirectional flow rates. A text label printed on the paddle or handle of any orifice plate customarily identifies the upstream side of that plate. In the case of the square-edged orifice plate it does not matter which side of the plate is upstream. 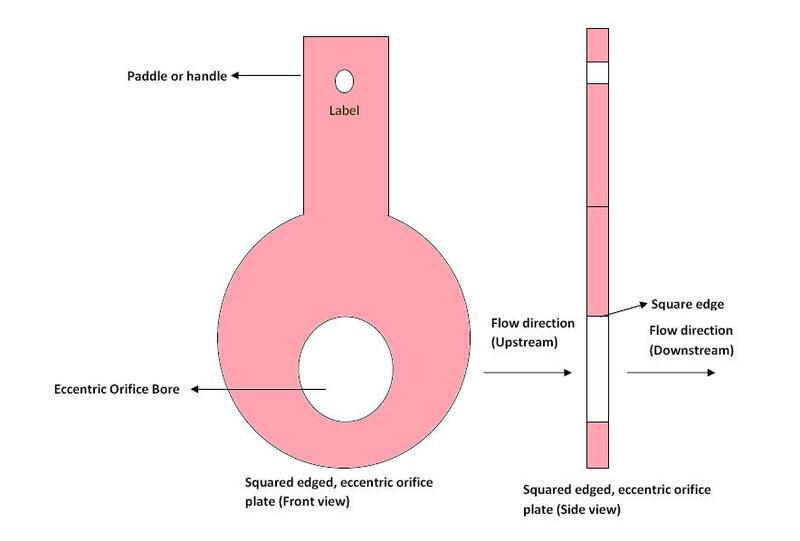 It is vitally important to pay attention to the paddle’s text label on the orifice plate as this is the only sure indication of which direction an orifice plate needs to be installed. Also shown in the above diagram is the side view for a bevelled square edge concentric orifice plate. The downstream side of the orifice plate is bevelled if the plate is relatively thick (1/8” or 1” or more). This bevelling helps to minimize contact with the fluid stream. Bevelled orifice plates are obviously uni-directional, and must be installed with the paddle text facing upstream while the bevelled end faces downstream. These are generally used when the process material contains foreign matter that may block the orifice in the case of a concentric configuration. Eccentric orifice plates are used to measure the flow of fluids that carry solids and are also used to measure gases which carry liquids. With the eccentric orifice at the top of the plate, it can measure liquids that carry gas. It should be noted that the eccentric orifice has a higher degree of uncertainty as compared to the concentric orifice. Segmental orifice plates are used to measure the flow of light slurries and fluids with high concentration of solids. The design of segmental orifice eliminates the damming of foreign matter and provides more complete drainage than the eccentric orifice plate. The segmental orifice is considerably more expensive than the eccentric orifice and has slightly greater uncertainty. 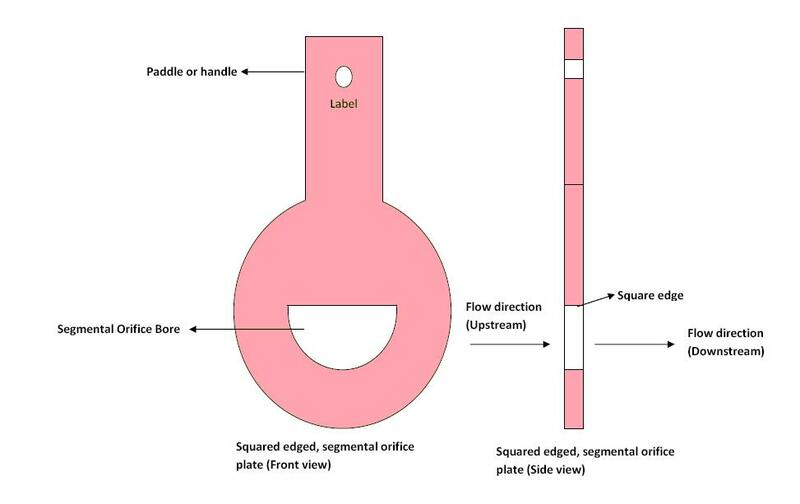 The upstream side of the bore is shaped like a flow nozzle while the downstream side acts as a sharp edge orifice plate. They are recommended for measurement of viscous fluids which have pipe Reynolds numbers below 10,000. An increase in the viscosity of a fluid flowing through a sharp edge orifice will increase the diameter of the vena contracta (point of lowest static pressure downstream the orifice bore), which results in a decrease in differential pressure. However, an increase in the viscosity of a fluid flowing through a flow nozzle increases the friction drop in the flow through the nozzle, which results in an increase in the differential pressure. The quadrant radius orifice plate combines these two effects to produce a constant coefficient.